The Viano String Quartet, praised for their “huge range of dynamics, massive sound, and spontaneity” (American Record Guide), won Third Prize at the 2018 Wigmore Hall International String Quartet Competition along with the Sidney Griller award for the best performance of the compulsory work, “The Four Quarters” by Thomas Adès, and the Haydn Prize for the best performance of a Haydn string quartet. 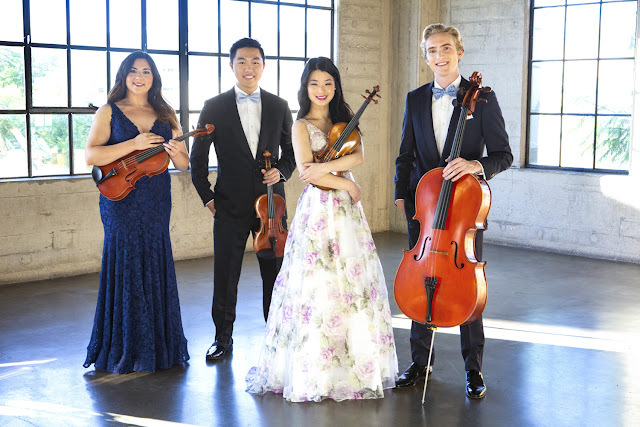 Formed in 2015 at the Colburn Conservatory of Music in Los Angeles, the quartet has collaborated with world-class artists such as Emanuel Ax, Paul Coletti and Martin Beaver. Most recently, the quartet had a residency at the Northern Michigan University and is currently the resident quartet at the Santa Monica Conservatory of Music. The Quartet works primarily with former members of the Tokyo String Quartet, Martin Beaver and Clive Greensmith, and Arnold Steinhardt. In May, the Viano String Quartet won the Silver Medal at the 2018 Fischoff National Chamber Music Competition, and in 2017 won Third Prize at the 9th Osaka International Chamber Music Competition.